Someone hit my Prelude, should I have it fixed or totaled? Someone hit my Prelude, and it was their fault. This is what the damage looks like. Their insurance is offering to either pay out $4800 to total the car, or $3800 if I keep the car and have it repaired myself. In addition to the damage, I have discovered other problems over the 7 months that I've owned it. All the ball joints and tie rods have to be changed out, I have to put in half a quart of oil whenever I fill up the gas tank, and it has a surging idle on cold startup. Sometimes if I'm idling for a long time, like at a stoplight, the engine temperature will rise. Also the alarm system doesn't work right so it's been disabled. I'm thinking of just having it totaled and buying something that is more reliable and maybe easier to work with, thinking about an Integra GSR. Not sure what it's going to be like going from a Prelude SH to a GSR though. Should I keep the car and take the lower payout, and drive it with a salvage title? Any opinions on this are welcome. Last edited by CRXPreludeDOOD; 12-13-2016 at 01:06 AM. 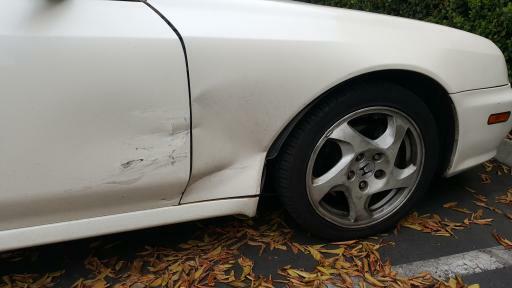 Re: Someone hit my Prelude, should I have it fixed or totaled? Last edited by TypeT; 12-13-2016 at 01:43 AM. There isn't any damage to the suspension from the accident, but before the car got hit it was making a creaking sound when I turned the steering wheel. I had two mechanics look at it already and it turns out that all the ball joints and tie rods have to be replaced. So that also has to be fixed in addition to the fender and door if I'm going to keep this car. just get parts from some parted out lude and buy new bushings for suspension parts? Last edited by TypeT; 12-13-2016 at 04:14 AM. If It was me, as much as you may love or not love the car, I would just go ahead and total the car. Around where I live, $4800 can get you a lot of nice cars, Prelude SH, Integra GS-R, NB or NA Miata, Camaro, All depends on what your driving style is. Thanks everyone for your opinions. I think I'm going to have it totaled, I already found 2 5th gen Preludes that I'm interested in, as well as a Bar'd H22 swapped Civic hatch. The money from the insurance will allow me to buy any one of these. Last edited by SoFlaKidd; 12-15-2016 at 02:40 PM. I just found out why that Prelude seems to have more pull than the other 5th gen Preludes I've driven. That H22 engine has a red valve cover instead of a black one, and I didn't know what that meant until now. It's the JDM 220 horsepower engine instead of the regular H22 that has 200 horsepower. But it's too late, I've already agreed to have them total the car. Hopefully they'll fix it up and sell it so someone else can drive that powerful Japanese engine on American roads. When my mechanic was changing the timing belt, he noticed something written on the engine, and he said that it was a newer engine that someone installed, and not the original engine that was in there originally. I also found out later that it had a new oil pan. The person I bought the Prelude from was selling it because he bought a 350z. So you know, racecar. You could also look by the flywheel inspection hole and you would see a stamp on the block that would tell you exactly what the engine was.